This satirical short story (or long joke) from Tony Andrews, depending on how you look at it, is still relevant even though the cast have changed portfolios since it was originally written, and one of the actors has left the stage. The lead character may soon join her. The Prime Minister of Australia called a meeting of his favoured ministers and, with a mischievous smirk on his usually vacant face, held one hand behind his back, as if hiding something that he didn’t want his ministers to see. He told them that they were there to select the next Treasurer, whoever was keen on the job just had to pass one or two little tests. These tests, he’d remembered, were used by his old employer when selecting high-level bank executives for promotion. With the skill of a small child interested in magic, he theatrically produced from behind his back a calculator. Everyone in the room was impressed with the trick from the party leader and clapped enthusiastically, in the obsequious manner to which they’d become accustomed to doing whenever Malcolm said or did anything. Malcolm, with an indulgent chuckle, stated that he could, if she guessed what it was. Julie, with forceful determination and just a hint of her trademarked, thin lipped smile, said that as soon as she’d received a detailing briefing from her staff, she’d report back on the outcome of the discussion regarding the mysterious object that he had placed before them and report back to the Prime Minister at the appropriate time … if she was advised to do so. Most of the ministers seated around the overly large conference table nodded sagely, accepting this as a valid course of action. Peter, the Minister for Foreigner Incarceration, who appeared deeply absorbed in a telegraph article about backpackers overstaying their visas, his mind wandering to how well his Filipino housekeeper kept his shirts white and crisp, glanced up at the Prime Minister and, thinking that he should discuss the article with his staff as soon as possible, almost as quickly forgot about it, his attention taken by the strange object on the table. “Give us a hint, Malcolm, please.” As an ex policeman, he prided himself in knowing the correct way to go about solving a case. “It has something to do with numbers,” said the PM, pleased that he’d remembered his training at Goldman Sachs. Before Christopher could interject, a high-pitched shriek was heard coming from near the front of the room. Malcolm, speaking as he turned toward the door, said, rather too loudly, “Michealia, this is a private meeting,” but the West Australian senator and newly appointed Minister for Unemployment was not there. The annoying sound was instead, coming from the foreign minister’s iPhone, an incoming text message. She read it to herself as the discussion about the mystery object continued around her. It was from a journalist she knew, responding to the photo of the PM and the object that she’d secretly leaked to him at the beginning of the meeting. “It’s a calculator,” she exclaimed enthusiastically, to which the PM agreed, with an admiring look at the sharp, intelligent, woman, seated beside him. “I knew that,” said Scott, who’d been remarkably quite during the discussion, thoughts elsewhere. Ever since Peter took over his portfolio, Scott had had trouble concentrating on anything. Even old war movies, of which he never normally tired, failed to hold his attention. “Maybe I should talk to Susan, the new health minister,” Scott thought, “I think I might be coming down with something.”. The Prime Minister asked him why he didn’t say he knew what it was before. “I wanted to see who my competition was,” drawled Scott, secretly hoping his short, snappy, line sounded like something his boyhood hero, John Wayne would say. Turning slowly and casting a baleful glare at those seated around the table, he said, venom dripping from his tongue, “I hate you all”, then to the PM, “see you next Tuesday,” and stormed out of the room. Everybody laughed, Chris was such a character. Malcolm then stood, and again, placed one hand behind his back. “Whom so ever guesses the correct amount shall here by and now, be proclaimed Treasurer, and shall rule beside me as my second in command”. 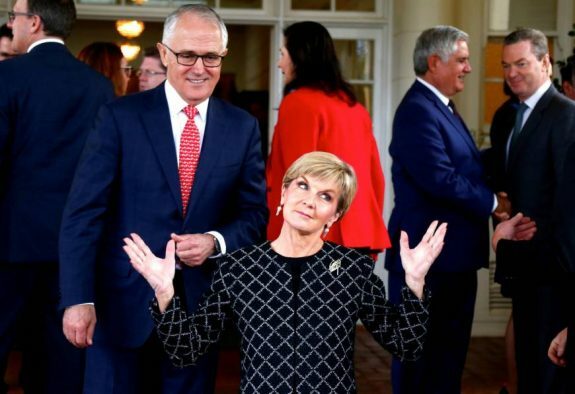 Malcolm gave a thoughtful nod and thought to himself how gifted Julie was and that she would be well suited to the role of Treasurer, but a hint of fear stopped him from voicing his appreciation, remembering that she had once told someone, who told someone else, who mentioned it to him, that she wanted to one day be Prime Minister. His thoughts were interrupted by a voice at the far end of the table. “Greg, I didn’t know you were here,” Said Malcolm, looking for the first time in months at his Minister for the Environment. “You, you told me never to answer any questions, you told me that, you said if I answer questions it could cost our donors a lot of money.” His voice rising hysterically. “I did as you said, Malcolm, I, I always do what I’m told.” His glasses slipped from his shaking hand, dropping onto the glass conference table with a clatter. Malcolm smiled lovingly at his Environment Minister, like a proud father listening to his youngest child. Greg looked up, a smile quickly appearing on his face. He was extremely relieved that he could finally make his exit and disappear. Something he knew he was very good at. He just wanted to escape to the safety of his office downstairs, lock the door and lay down on his settee. Finally, after Julie had recited every Australian banknote value she could think of, Scott, remembering a well-rehearsed fact from his time as Unemployment Minister, a fact that cost the department a couple of million dollars, paid to a leading private research group. Scott answered his leader. “A five dollar note, it is, Prime Minister”. His triumphant victory giving him a Yoda like impression of himself and this was, parrot like, reflected in his speech. “Correct, Treasurer,” stated Malcolm, pleased that the treacherous woman beside him was not going to be challenging him for his job any time soon. The Prime Minister slipped the five dollar note into his coat pocket, his mind already concerned with contacting his broker to discuss rising stocks, laddering, and two-tiered investment strategies. Julie, busy typing a text on her i phone, barely even noticed them leave. Still funny, because it’s still true? I liked that. Very amusing. I wept. Poor Australia. It was my five dollar note the scoundrel nicked. So that week all I had was a bottle of beer and no MacDonald’s. Sadly, so bloody true of ALL these inept, lying, obscenely over-paid so-called liberals! And very probably, so close to the bone on how they ALL are too! Well written article Tony & thanks as usual for the AIMN site! Another tough decision between laughing or crying.